Distributed By – Columbia Records Of Canada, Ltd. Printed By – Shorewood Packaging Corp. Of Canada Ltd. 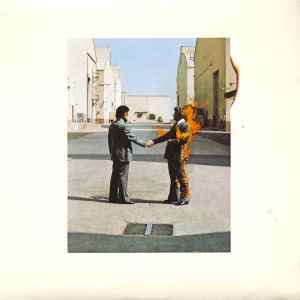 Published By – Pink Floyd Music Publishers Inc. Pressed By – Columbia Records Of Canada, Ltd.
Legal text on back cover is on three lines. Great Pressing, much better than new reissue. Quiet pressing with a smooth, detailed sound and full bottom end. True all analogue sound. Man this press sounds very detailed - this copy is very quiet in white noise areas (could just be my copy but yea!). Blown away what a nice surprise. First pressing come in black shrink wrap and round Wish You Were sticker.